Subaru Outback - Subaru Outback Forums > Models > Gen 2: 2000-2004 > 02 H6 cooling and check engine codes. I wonder if clearing the codes and then seeing which one(s) comes up first would help. As it is, there's two codes for the Bank 1 Sensor 1 (right side A/F Sensor) and one for the Bank 2, Sensor 1. That might be due to a common heater supply problem, perhaps just bad connections at one of the engine-bulkhead wiring connectors, or at the ECU. Recently my car will warm up but will remain between the two lines wont go above and does not necessarily cool down to normal operating temp. Weird part is if I take a Hard left turn my temp gauge will drop significantly. Like as if it was operating at normal temp. So that confuses the **** out of me. I have smelled a light radiator smell while driving but im not losing or burning it as far as I can tell. I keep recycling whatever goes into the reservoir when it warms up. Thank you to @botenredwolf your suggestion was helpful. I have not heard any whistling with the car and the exhaust looks fairly clean was thinking about changing exhaust gaskets right where it begins. because i have dropped that before when i did my Rack and pinion. How many sensors does this car have for temp. I know the main thermostat and the coolant sensor. I have changed both of those. Im going on a trip soon and I'm unsure if I should drive it. I mean the car does not overheat just warms up and stays within the middle not going above the first line on the temp guage. Like a four hour car ride type trip. Just one sensor from what I can recall, and it's up on the top of the engine somewhere. 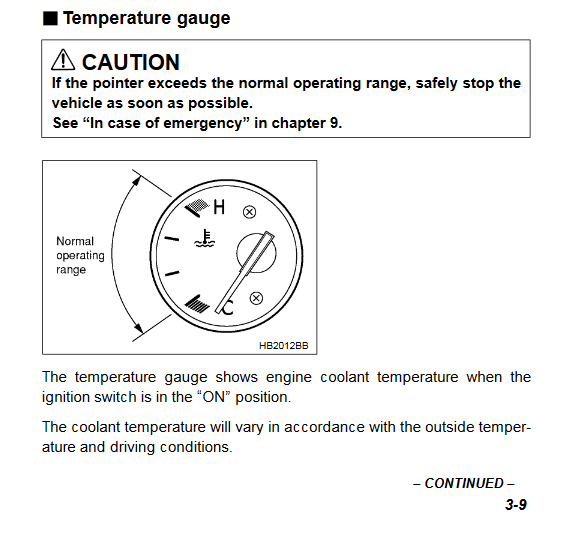 Attached is a cheat sheet for the temp gauge (taken from the manual on mysubaru.com for my model year, a 2001 H6). From 170F-220F it will hover just above the second line (just below straight left, or "west southwest" if pretending this is a map). 220-240F spans the remainder of the gauge. 240+ will put you solid in the red, and that's the no-no zone. A quick "tattletale" will be the "VDC OFF" light illuminating for no apparent reason, this happens when you break 220F and won't turn back off until you go below 216F. AC also shuts off around 230F. If none of that stuff has happened, I think you're in the safe zone and can safely drive it, even on longer trips, as long as you mind the air bubble that keeps popping up. If you haven't had a chance to burp it like a boss, I just did mine the other day and it's been behaving rather well for the last few hundred miles. Get it on a steep hill, front of the car pointing up: pop the radiator cap, recycle some of the coolant from the reserve (leave it between the lines), put the reservoir back in, start it up, and fill the radiator up. Go in and turn the heater all the way up (85 and it just won't stop trying to heat the car). Let it run until the gauge makes it to generally "west". Keep an eye on it to make sure it stays there during the rest of this. Bubbling/dripping/leaking/overflowing from the rad is normal at this point since you're still uncapped. This next part will make a mess, so mind any spillage and nearby creatures, as they like the smell, but consuming it will be bad. Slowly increase the engine RPM to stir up any remaining bubbles in there and force 'em out. I usually go up to about 2,500-3,000 for maybe 5-8 seconds. Many times when spinning up and/or when releasing the throttle, a good amount of coolant will spill out. Ensure it's still full afterwards. Re-cap and enjoy. It should heat cycle properly for at least the next few driving cycles, even if there is a small breach somewhere allowing air to get sucked in.